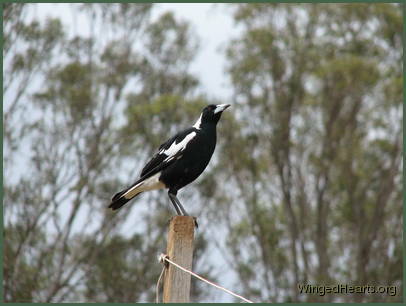 Here is Maggie - our male mapgpie - standing on the post. 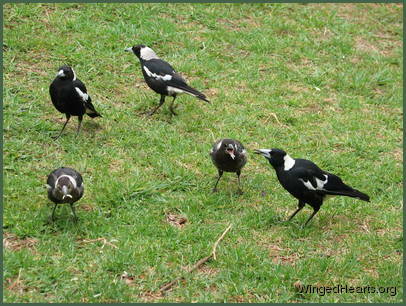 Contrary to public opinion Magpies are a very loving, generous, adaptive and communicative species. Well known for their beautiful voices and loud carolling, they can also mimic a variety of other birds and sounds. 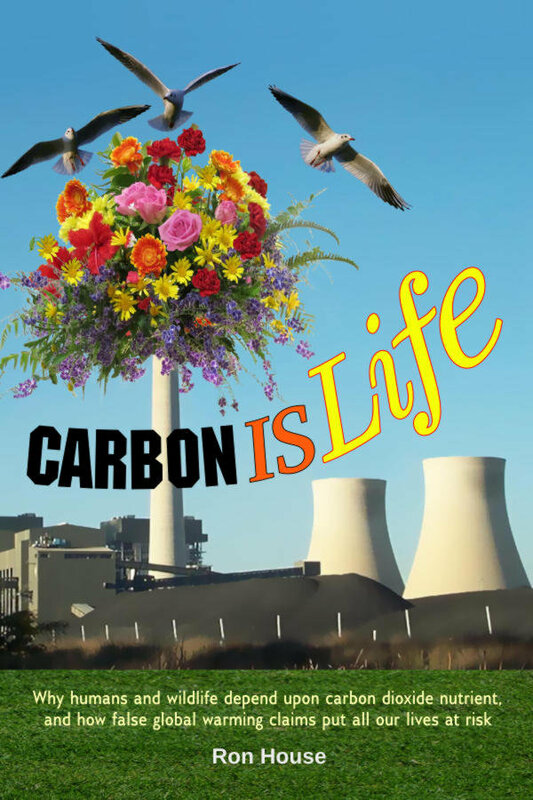 They are caring and dedicated parents being very protective of their young, whom they nurture lovingly. 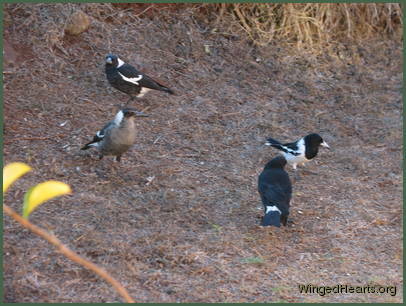 Magpies potter on the ground, digging up worms and bugs just under the surface for food. This means they need space for themselves and their young to teach them to feed themselves and survive. During breeding season they are notorious for swooping on people in their attempts to clear some space for themselves. This act has earned them their notorious reputations. 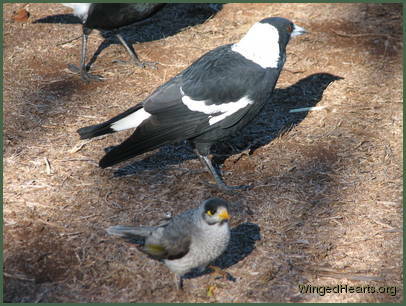 The species is protected in Australia, and if an offending magpie dad is removed, the foster dad helps in the care and protection of the chicks. 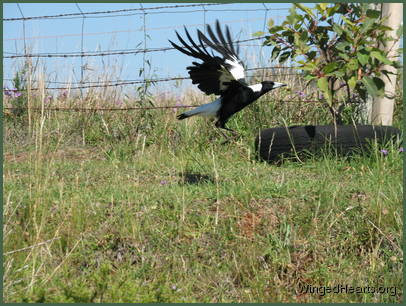 Extremely intelligent, flexible and adaptive, magpies protect the smaller birds in the bush from predators and also mediate with the larger birds. Magpie dads take huge risks, placing themselves in great danger when they chase eagles to heights greater than the crows can climb, in their attempts to drive them away from the breeding zones of all the other birds. We have learned an immense amount about the lives, loving hearts, relationships and services within the lives of birds from Maggie and his family. This website is dedicated to improving the understanding between birds and humans because of the extraordinary capabilities of this bird and his species. As you can see, we are avid fans and ardent admirers and hope to influence many. 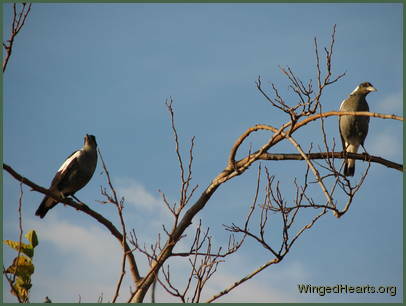 To read about the birds and see a slidehsow of the birds chasing snakes click here. To read the story and view video of the birds chasing eagles click here.